Why Brain Surgeons Want Help From A Maggot-Like Robot : Shots - Health News While watching TV, a neurosurgeon got the idea for a robot that would help minimize collateral damage during operations to remove tumors. Now he and colleagues at the University of Maryland are making progress on a wormy robot that could be ready for testing in humans in a few years. 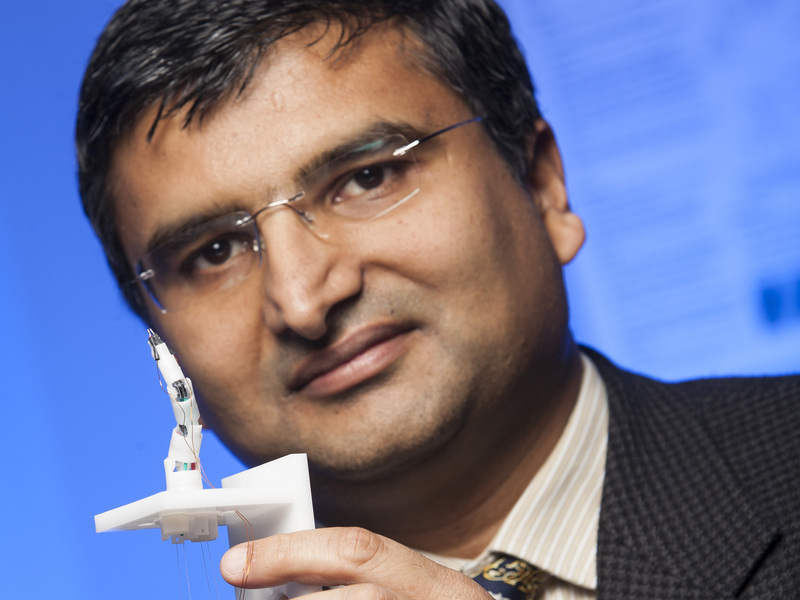 University of Maryland's Jaydev Desai shows off a prototype of a robot that he and colleagues are developing to minimize harm to patients during brain surgery. The idea first came to Dr. J. Marc Simard, a neurosurgeon and professor at the University of Maryland School of Medicine in Baltimore, while he was watching TV. He saw plastic surgeons use sterile maggots to remove damaged tissue from a patient. "It sounds strange, but it's a real thing," Simard says. And that's when he had the idea. "If I could train maggots to resect brain tumors I would," he says. "I can't do that, so robotic maggots are the next best thing." He teamed up with Jaydev Desai, a roboticist at the University of Maryland in College Park, and radiologist Rao Gullapalli to create a working prototype. They call it MINIR — Minimally Invasive Neurosurgical Intracranial Robot. The wormy, multijointed prototype is about a half-inch wide, which Simard says is half as the size of tools he uses now. But Simard says what really sets MINIR apart is that it works while the patient is inside an MRI scanner. The surgeon can look at what's happening inside a patient's brain without having to open it wide. It's difficult for the naked eye to discern cancerous tissue from healthy tissue, so surgeons depend on MRI scans to locate brain tumors. So, surgeons usually take a scan before operating. But things can shift around as they work. That's where a robot that worked inside an MRI could help. A surgeon might someday insert a small tube leading to the site of the tumor, then send a robot crawling in. The doctor would control the robot remotely while watching its progress on MRI scans. This approach would be less invasive that traditional surgery and makes it easier for surgeons to avoid harming parts of the brain that control essential functions like speech and vision. The project is funded by the National Institutes of Health. So far, Simard says, they've successfully tested the device in pig cadavers. The researchers says they'll be ready test on humans within three to five years, if all goes well. Johns Hopkins neurosurgeon Alfredo Quinones-Hinojosa, who isn't involved in research, says the project looks promising. "Ideally, you want to minimize the collateral damage" with brain surgery, he says. A neurosurgical robot is one way to do it. Deep-seated tumors are the hardest to treat. "By the time you get down to the tumor, you've already injured the patient," Quinones says. And once you're there, he says, it's hard to tell the difference between normal and pathological tissue. "I compensate with the use of a microscope," he says. He also takes MRI scans intermittently throughout the surgery. But for the surgeon, nothing beats being able to operate while the patient is inside an MRI. Desai, the team's engineer, is experimenting with different materials and technologies to balance cost and function in the robot. He expects that the final product will be disposable. His biggest challenge is finding materials that are compatible with the strong magnetic fields of the MRI. Some materials equipment can distort images. Others pose safety hazards. "An electromagnetic motor will get pulled toward the MRI" and could slice through brain tissue along the way, Desai says. "That's why we're looking at alternative solutions." Desai's latest prototype uses a system of pulleys and cables, but he's also looking into using a special type of nonmagnetic motor. With the current prototype, the surgeon can control the robots pulleys from outside the MRI. But once he pins the mechanics down, Desai says he'll focus on developing a simpler system surgeons can use to make the robot do their bidding.